County Clerk George H. Webb of Louisville, Ky., tells a thrilling story of how himself and wife and five other passengers were robbed in a California stagecoach on the 13th of August. The stage was on its way from Madera to the Yosemite Valley, a two days’ ride over the mountains. The passengers, besides Mr. and Mrs. Webb, were Captain Murray of England, a Mr. Ray and sister of Buffalo, N.Y., and Captains Clayton and Johnson of Fort Smith, Ark., seven persons in all besides the driver, a man named John F. Stevens, who had made many a trip before without ever being compelled to “throw up his hands.” About 11 o’clock in the morning of the second day out, and when the stage was nearest Yosemite Valley, the horses attached to the vehicle had just succeeded in pulling the lumbering wagon to the highest point on the road, being an elevation ot 6,000 feet, and overlooking a tremendous abyss. The passengers, little dreaming of what was in store for them, were commenting upon the grandeur of the surrounding scenery, when just as they made a short turn in the road they were confronted by three masked men armed with shot guns, pistols and dirks. George Webb, raised in Kentucky and well accustomed to the use of fire arms, went back to his hip pocket, when looking back at the hind end of the stagecoach be found a shot gun leveled at his head. Back went the pistol into George’s pocket, and up went his hands. “Now, we will just take you one at a time. This way my little daisy,” said one of the villains, as he seized Mr. Webb by the arm and jerked him out of the coach. “Just stand still a few moments and we’ll fix you up in a hurry.” Mr. Webb submitted quietly, for there was no other alternative unless he desired to have the top of his head blown off and his body thrown over the cliff. With hands raised high in the air and a gun at his head, George allowed himself to be robbed of all his valuables — a gold watch and $300 in cash. “We’ll take the old English gentleman with the cream colored parasol under his arm, next,” said the leader of the band. “Step this way, please,” and Captain Murray, who had fought in several wars and knew no such thing as fear, stepped out and submitted meekly to the relieving process. Two hundred and fifty dollars and a gold watch was the extent of the captain’s loss. Then came Mr. Ray, who was held up for $325 and a fine watch. The two captains from Arkansas came next. Their valuables consisted principally of drafts and checks. These were taken and shoved down in a big pocket of the leader’s coat, along with the rest of the plunder. Up to this time the ladies had not been molested, but while the men were being searched Mrs. Webb slipped off a valuable diamond pin unobserved, and slipped it into her bosom. She was as cool as a refrigerator, and exhibited more real genuine bravery than all of the male passengers put together. The robbers turned their attention to John F. Stevens. “Now my hearty,” said one of the gang, “just cut them thar hosses loose and set ’em adrift.” Stevens was slow about complying, for he had an object in view. He knew that the stage coming from Yosemite Valley was almost due, and by “killing” time, assistance might arrive and the robbers be overpowered and captured. 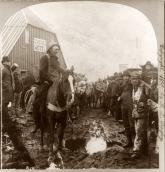 “Cut them horses loose, and be d—n quick about it,” repeated the leader of the band, “or — — you, there won’t be enough left of you to make mincemeat pie.” Stevens saw that they meant business and commenced unhitching but so slow was he about it that two of the gang drew their dirks and slashed the harness right and left. Bang! bang! went a couple of pistols in the hands of the villains, and away went the four horses at breakneck speed around the curve and down the road. When the horses were cut loose the coach began to roll back down the hill and Miss Ray, a young lady from Buffalo, who was still in it, began to scream for some one to help her off. Captain Murray of the English army, who was one of the party, requested the bandit who was doing the searching to let him assist the lady. “You are too d—d polite entirely,” was the reply. After the horses had been started down the mountain, one of the robbers, whose dialect indicated that he was a Mexican, took a position at the tongue of the wagon. Mrs. Webb and Miss Ray were sitting on the driver’s seat. The greaser noticed that Mrs. Webb had a handsome satchel on her arm, and thought that it contained valuables. “There, take it, you old villain,” said Mrs. Webb as she spitefully threw the satchel at the robber’s head. He picked it up and then the trio of daring highwaymen bade the passengers adieu, and were off like a flash.